THE reigning premiers have chosen to defend their premiership title by bolstering their forward line stocks. While the Bulldogs lost star players such as Emma Kearney, Jenna Bruton and Aasta O’Connor, they don’t seem to be too worried, recruiting some young, experienced and international talent into their 2019 side. Eleanor Brown will be a fitting replacement for Emma Kearney in the midfield. She possesses elite ball-use, especially by hand, often disposing of the ball quickly and cleanly to escape congestion. Brown also has a long and powerful kick, and can make an influence all over the ground. 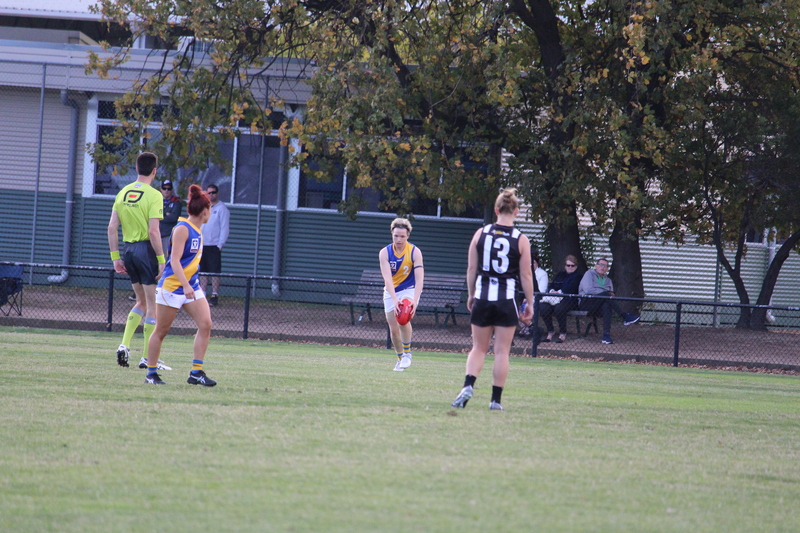 She spent some time at half-back during the AFL Women’s Under 18 Championships, racking up numerous disposals. She can also mark the ball well, making her a good fit to replace the loss of an important premiership trio. Coming from the Crosscoders program, McCarthy impressed the Bulldogs, who took the forward with their 23rd pick. McCarthy played in the forward line for her Gaelic football side, and has now crossed over to Australian Rules to display her speed and agility in the competition. She will be a great addition to one of the most exciting forward lines in the league, which contains the likes of Katie Brennan, Isabel Huntington, Bonnie Toogood and Brooke Lochland. The Bulldogs have further bolstered their inside 50 stocks with the addition of 19 year-old Kate Bartlett. Bartlett missed out on being drafted last year but will get her chance in the red, white and blue this season. 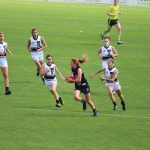 It was hard to look past her at the AFL Women’s Under 18 Championships, as she dominated inside 50 for Western Australia, kicking six goals in five games and creating plenty of scoring opportunities. She earned a place in the All Australian team as a result, and will now fly across the country to join the Bulldogs. Selena Karlson will help aid the loss of Bailey, Ebb and Ashley, who departed the club in the off-season. She is a smart defender who played 12 games for the Southern Saints this season and finished in the top 10 of their Best and Fairest. Karlson was also named in the best three times. Jessie Davies is no stranger to the Western Bulldogs outfit, having spent time with them during the VFLW. She is a versatile utility who will add some depth to the side. Davies played seven games for the Bulldogs this season and is also a member of the VU Western Spurs. Having a player that can be used all over the ground will help the Bulldogs cover their off-season losses, especially that of Aasta O’Connor, who can be used in different areas of the ground. Instead of replacing their losses, the Bulldogs went in a different direction for the draft, opting to boost their already powerful forward line. This isn’t a bad strategy at all, as more firepower inside 50 gives them more of a chance to defend their premiership title. But in the midfield, they could struggle, as the loss of Emma Kearney, Jenna Bruton and Daria Bannister will be hard to replace. Thankfully, Eleanor Brown will fill a part of this void, thanks to her brilliant hands and strong kicking. Selena Karlson will also fill part of the absence of Ebb, Bailey and Ashley in defence, after playing for the Southern Saints this year. Having a versatile player like Jessie Davies will also be valuable to add support roles into different sections of the field. Despite a stellar inside 50 line-up, the Bulldogs could struggle through the midfield and in defence, with the loss of some key players. Aasta O’Connor’s void in the ruck has also not been filled, making the ruck situation an interesting one. COLLINGWOOD lost its first game of the Victorian Football League (VFL) Women’s after 14 rounds of action and consequently lost top spot on the ladder. At the bottom of the ladder, the Seagulls experienced a rare highlight for their season when they clinched a thrilling one-point win over Richmond. With only two rounds to go, the ladder could still change in what looks to be a thrilling finals series. Melbourne University has claimed a huge 53-point win over Casey Demons, courtesy of a dominant first half. The Mugars booted the only five goals of the first two quarters, with the Demons managing just the one behind in challenging conditions. With the ground wet and the blustery wind causing problems for some, the Mugars made the most of it. Casey played well in the third term, with Maddie Shevlin producing a huge 50 metre goal for the Demons’ only of the game, to outscore the visitors. Unfortunately for the home team, Melbourne University got back on top in the final term, booting two goals early to wrap up the match, and then two in the final two minutes to blow the margin out to almost nine goals. Madison Prespakis starred again for the winners, doing some unbelievable things, including a snap out of nowhere for a goal, on her way to 28 disposals, two marks, six tackles and a goal. Captain Ashleigh Riddell was prominent with 18 disposals and an important first quarter goal, while Sophie Abbatangelo (15 disposals, four marks and two goals) and Caitlin Greiser (12 disposals, three marks and two goals) worked hard together in attack. For Casey, Shevlin was the big ball winner, racking up 22 disposals and booting the Demons’ only goal, while Casey Sherriff was arguably the best for her clean ball use in defence, racking up 14 disposals and laying six tackles. Sherriff teamed well with Darcy Guttridge back there, who picked up 11 disposals and three marks, while Eden Zanker was promising in the ruck. It was a good old fashioned shoot-out at Bill Lawry Oval, with both the Falcons and Saints going goal-for-goal. In a hotly contested match, Darebin looked to have broken away in the second term, but the Saints fought back to go in even at half-time. Accuracy did not seem to be a problem for either team with no behinds scored in the first half of footy, credit to their cleanliness by foot. But in the end, it was the Falcons that secured the win by four points in a very tight game to keep their finals hopes alive. The Falcons were on song with the likes of Hannah Mouncey finding the goals and imposing herself around the contest with her strong hands. Teammates, Lily Mithen and Georgia Hammond were also impressive with their clean hands at the coal face and ability to dish off clever handballs under pressure. Down in defence, Meghan McDonald played her usual role, taking a heap of intercept marks and controlling the defensive 50 for the Falcons. Meanwhile for the Southern Saints, Alison Brown showcased her good hands in tight, extracting the footy out of the congestion cleanly and cleverly. Rhiannon Watt provided a good target up forward and worked tirelessly throughout the match to win the footy. Courtney Jones was impressive for the Saints, opening their scoring account and getting involved in the contest, as was Alison Drennan who was influential across the ground with her silky skills. Collingwood experienced the losing feeling for the first time this year on the hallowed turf of Victoria Park. The Pies couldn’t kick a goal during the whole second half while the Thunder kicked three crucial majors to claim a vital win, and top spot on the ladder. Captain, Angela Foley had a blinder of a game, being one of two multiple goal kickers for the Thunder, as well as racking up 29 disposals and taking four marks. The other multiple goal kicker was 23 year-old, Jordann Hickey, who booted home two majors from her 10 disposals. In terms of disposals, Adelaide AFLW forward, Jenna McCormick led the way with 31 touches to go along with seven marks. 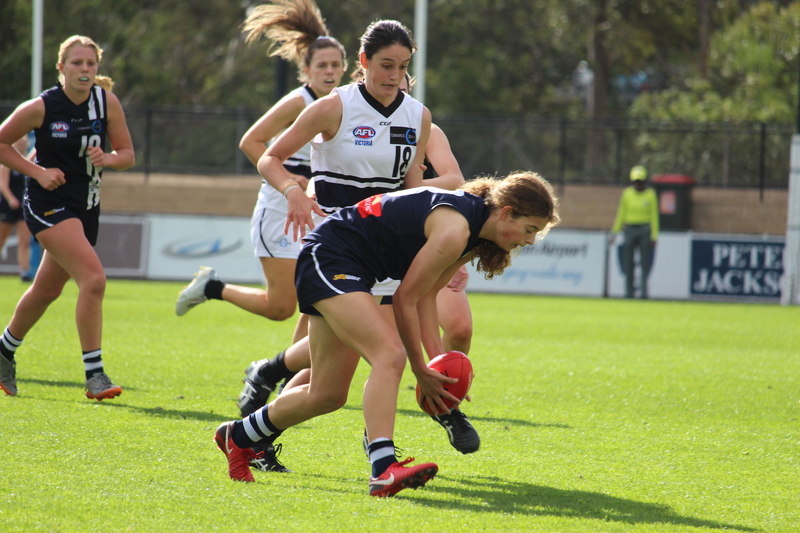 Vic Metro forward, Daisy Bateman was one of four single goal kickers for the Pies, and also racked up nine disposals. Her Oakleigh Chargers teammate, Hannah McLaren racked up the disposals, gathering 20 touches for the Pies. She was complemented by a great all-round game from Sophie Alexander, who gathered 23 disposals and laid six tackles. Former Murray Bushrangers defender, Iilish Ross led the way in the tackling department, laying 11 for the match. Geelong took care of business at GMHBA Stadium, recording another big win over another cellar-dweller in the competition. This time, Essendon was on the end of the big margin, only managing two goals for the game, while the Cats booted eight. Danielle Orr and Mia-Rae Clifford were the two multiple goal kickers for the Cats with two majors each. In the midfield, it was Richelle Cranston who dominated yet again with 24 disposals, two marks and three tackles. Geelong Falcons duo, Olivia Purcell (18 touches) and Nina Morrison (16 touches) also contributed well on the day. For the Bombers, Hayley Bullas provided some positives with her 20 disposals, three marks and a whopping 17 tackles. She was complemented by the consistent Jessica Trend, who racked up 18 disposals, five marks and nine tackles. Trend led the way for marks in the match, taking the most grabs out of any player in the match. Alex Quigley and Monique DeMatteo were Essendon’s goal kickers. Williamstown has recorded a thrilling come from behind win to secure its second win of the season. The Seagulls hadn’t scored a goal up to half time, but found their mojo in the second half, outscoring Richmond five goals to two. North Melbourne recruit, Jasmine Garner had a marvelous game for the Seagulls, kicking two goals and racking up 21 disposals as well as five marks. Her fellow Kangaroos recruit, Jess Duffin led the way in disposals, gathering 30 touches as well as two marks and four tackles in another sensational performance. Jenna Bruton’s fierce attack on the ball was key to Williamstown’s victory, as she laid a game-high 12 tackles to go with her 19 disposals. Phoebe Monahan once again led the way in disposals for Richmond, gathering 25 disposals and seven tackles. Of those 25 disposals, 23 were kicks, highlighting her ability to get the ball on the boot and penetrate it forward. She was complemented by Lauren Tesoriero, who gathered 22 touches and took three marks. Kate Dixon was a focal point up forward, kicking two majors to go with her 10 disposals. The Bulldogs succumbed to their second consecutive loss, but this time the margin was much greater, hurting their late finals charge. The Hawks led at each break and did the most damage in the third quarter, where they kicked three unanswered goals. The Hawks had three multiple goal kickers in Sarah Perkins (three), Emily Gilder (two), Phoebe McWilliams (two) and Rosie Dillon (two). 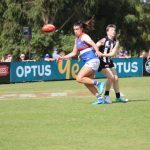 One player that could have kicked multiple goals was Rebecca Beeson, who finished the match with one goal and three behinds. That didn’t seem to faze her though, as she was the leading disposal-getter on the ground, gathering 25 disposals. Julia Crockett-Grills and Meg Hutchins also found plenty of the footy, racking up 18 touches each. For the Bulldogs, it was Lauren Spark who led the way in disposals. She gathered 17 touches and took six marks on the day. Ashleigh Guest was next best with 14, while Bonnie Toogood racked up 12 touches in her first VFLW game. Bailey Hunt provided some positivity for the Dogs, as she kicked a goal and led the way in tackles, laying eight for the match. ROUND 14 is another huge round of footy with several teams battling for positions as we head towards September action. In perhaps the game of the season, Collingwood battle the Thunder at Victoria Park in a game with huge implications at the top of the ladder. Important games for both Hawthorn and Geelong will also take place, as they look to lock up a top four position before they both face tough challenges in their final two games. Round 14 action kicks off with Casey hosting Melbourne Uni. The Demons come off a solid victory over Carlton, as they improved their record to five wins from 11 matches. Sitting two and a half games out of fourth place, the Demons will be looking to continue their momentum against a struggling Melbourne University side. Eden Zanker starred again last week, as she continues to be a huge positive in an otherwise disappointing season for the side overall. Kate Hore also turned out another strong game as she continues to build some good form. Melbourne University, who is fresh off the bye, is looking to close the season on a high and move its way up the ladder. Vic Metro midfielder, Madison Prespakis has been in great form for the Mugars, consistently racking up over 20 possessions. She will be joined in the side this week with fellow state representatives, Rebecca Webster (Vic Country) and Libby Haines (Tasmania and Eastern Allies), who could cause some headaches for their opponents. A massive encounter takes centre stage on Saturday as the ladder-leading Collingwood takes on the second-placed NT Thunder at Victoria Park. The teams met in Round 8, with the Pies getting the better of the Thunder in a blowout. 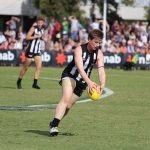 The Thunder has since gone on to win its next five matches following the defeat and has kept pace with the Magpies, who have continued their undefeated season. Chloe Molloy will miss the game again this week in what could be a huge out for Collingwood, as well as Jaimee Lambert, who has been an impact player for them this season. Steph Chiocci played herself back into form last week with a strong 13-possession, two-goal performance in just her second game back from injury. The Thunder has been unbelievable in the past month and registered another blowout win last week against Williamstown. With dominant performances across the board, NT comes into the game in as good of form as anyone in the competition. Anne Hatchard kicked four goals and was extremely effective inside the forward 50 with five marks to go along with 15 possessions. 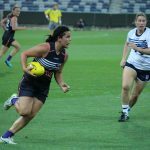 She was complemented by fellow AFLW player, Emma Swanson, who was a ball magnet through the midfield with 27 touches. This is a huge game which will shape the entire season, as the winner will move into top spot with just two games remaining. Darebin appears to be hitting its stride at the right time of year, but it may be too little, too late. Following a huge win over premiership fancies, Hawthorn, the Falcons take on the Southern Saints at home. A huge midfield match-up this week could see Falcons star, Elise O’Dea go head-to-head with Saints gun, Alison Drennan in one of the best individual match-ups of the season. O’Dea was prolific last week with 26 possessions, and continued what has been an incredibly strong stretch of play. Lily Mithen also continues to develop nicely and is playing a big part in the Falcons’ late season surge. The Saints enter the game with extreme confidence, having beaten the Bulldogs comprehensively last week to end their six-game winning streak. 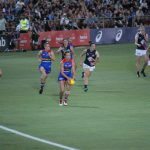 Alison Brown was dominant through the middle of the ground with 28 possessions, and Tara Bohanna also had an impressive outing up forward. Her three-goal haul last week pushes her into the top five goal kickers for the season. Although finals are out of the question for the Saints, they have the opportunity to play the spoiler role and end the Falcons’ season. The Cats host the Bombers in the final game of Saturday action as they look to continue their premiership quest. Geelong sits in fourth position and will be looking to move up the ladder in the final three rounds, with this round especially looming as important. The Cats find themselves in a game they should be able to take care of business in, while the sides above them face tough competition as the Hawks take on the in-form Bulldogs and Collingwood battles the Thunder in a head-to-head match-up. A win for the Cats allows them to close the gap on those above them and push towards a home final. Essendon continues to struggle with just one win to its name at this point in the season. A strong second half against Collingwood last week should give the Bombers the belief that they can hang with the best teams in the competition, with it just being a matter of putting together a full four quarter effort. Tanya Hetherington has been fantastic for the Bombers in recent weeks and will once again be a key performer if the Bombers are able to pull off one of the upsets of the season. Sunday action kicks off with Richmond taking on Williamstown down at Tigerland. In a game with no impact on finals, both sides will be hoping to end their respective losing streaks and build some momentum heading into next season. The Tigers come in on a six-game losing streak and will need to bounce back following their worst loss of the season last week in a 10-goal loss to Geelong. Richmond’s forward line continues to be an issue, kicking just one goal last week, in what has been a poor stretch offensively for the team. Two big ins should boost the Tigers’ chances with Lauren Tesoriero and Christina Bernardi making their return to the line-up. Williamstown has just one win to date, with that being in Round 4 against Richmond. The Seagulls are also coming off a poor performance last week, losing by 45 points against the Thunder. The consistency from their middle to low-end players continues to be an issue with Jess Duffin and Jenna Bruton continuing to carry the load, with more help required from their depth. With games against Essendon and Melbourne University to follow, the Seagulls have an opportunity to close the season out strong and put some wins together heading into the off-season. The Bulldogs saw their magical winning streak come to an end last week in a poor performance against the Saints. The Dogs were simply noncompetitive after the first term and have put themselves in a vulnerable position with only three games remaining. 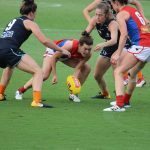 Needing to win their remaining games, as well as have results go their way, finals now look unlikely for the champions of the AFLW. The Dogs will need a number of big outings across the board and will hope that their inclusions this week, lead by Deanna Berry and Bonnie Toogood, will have an immediate impact in their entry to the side. The Hawks find themselves firmly entrenched within the top four and have the opportunity to officially clinch their finals berth with a win this week. They will be looking to bounce back following just their third loss of the season last week in a thriller against the Falcons. Emma Mackie returns to the line-up in what should be a boost to the team and help cover the loss of Melissa Kuys, who will be a key out.